Kash “Untouchable” Farooq was down at the Ponds Forge Arena in Sheffield last week, with his manager Iain Wilson, casting his eye over the bout between Josh Wale and Bobby Jenkinson. Josh won with a 9th round stoppage to successfully defend his British Bantamweight Title for the 2nd time. 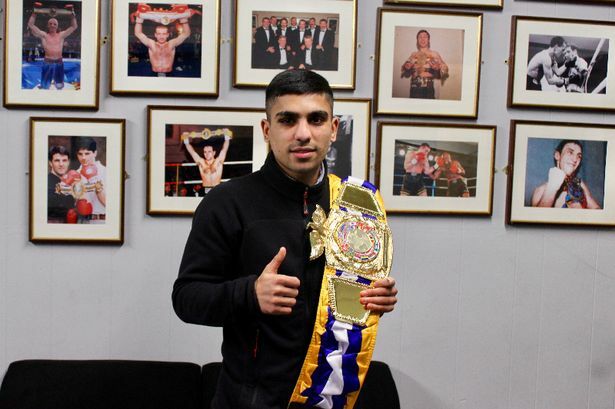 Kash who is the mandatory challenger for this belt will be the man charged with stopping him having a 3rd defence and winning the coveted Lonsdale belt outright. Trained by Steffy Bull Josh 29 is a tough competitor with a decent right hand who likes to come forward. He will have the advantage in experience with 37 fights having won 26, lost 9 with 2 draws and will also possess a height advantage. He will more than likely also have home advantage as the fight will probably be on his home turf of Barnsley or Sheffield. Possibly in the best form of his career to date, he will also have the motivation of knowing that victory lets him keep the belt for good which is something that will mean a lot to him. At 22 undefeated Kash has only had 8 professional contests but is rapidly improving with every fight. He is the current Scottish champion after defeating Scott Allan to win the title in the 8th round in November last year. He is a slick counter puncher with great head movement and fantastic footwork. He is sitting down on his shots more now as well which is helping his own power and seems to have a great relationship with his trainer Craig Dickson along with Colin Bellshaw. He will no doubt get some good insight into how to fight Josh as his new stablemate, Jamie Wilson, who signed with St Andrews Sporting Club last year lost a close point’s decision to him last July. Josh will be hoping that this fight is a bit too soon for Kash and that he will have too much to offer in terms of strength and also be able to “old man” him out of the fight. If Josh can dictate the fight and rough up Kash then it could be that his power can be the determining factor that can help him win this fight and move on to bigger nights further down the line. A Kash victory could also set up a fantastic all Scottish clash with former sparring partner Lee McGregor who is being pushed hard for a shot at the Title this year despite only having had 2 fights himself so far. This one has the makings of a great matchup and hopefully should be agreed by the middle of this month with the fight expected to be around May. In terms of who will win, I feel this fight will ultimately be decided by that old saying of “you can’t hit what you can’t see”. In my view Kash will be too fast and too elusive, he will gradually break Josh’s heart and his will and go on to wear him down and become the new Champion in a hard fight that will go the distance.